Warm weather is here and for Civil War reenactors, it's time to bring out those sheer dresses! Wait, sheer dresses, you ask? The modest Victorians actually wore outfits that you could see through? I kept cool in my light weight sheer! 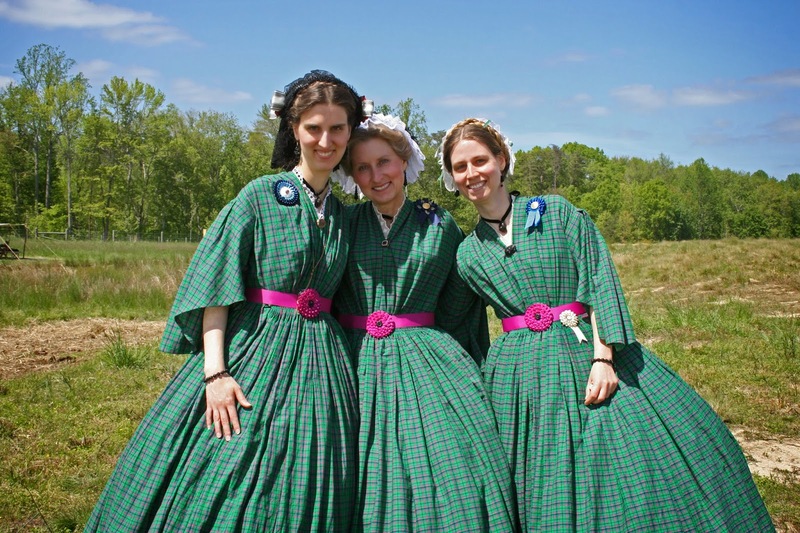 Reenactors are often asked in the summer time whether they are hot in their 1860s outfits. The answer is, if you are wearing the appropriate undergarments and light weight summer clothes, you actually don't get much hotter than a person wearing modern shorts and a tank top. I can prove this from personal experience: When I attended the 150th Gettysburg reenactment, it was HOT and MUGGY. I was very warm and "glistening" by the middle of the afternoon. However, on the final day when I changed my 1860s sheer dress for shorts in order to take down the tent, I found that I was hotter in my shorts than I had been in my dress! Undergarments made from natural fibers like cotton soak up your perspiration and the damp clothing next to your skin cools you down. Add that to the fact that your skin is protected from direct sun, and it makes sense that an 1860s outfit can be comfortable even in the heat. So let's take a look at those lovely sheer confections that our foremothers were wearing in the summer. In some ways they follow the regular fashions of the times, but in others, they are quite different! Let's start with the fabric itself. 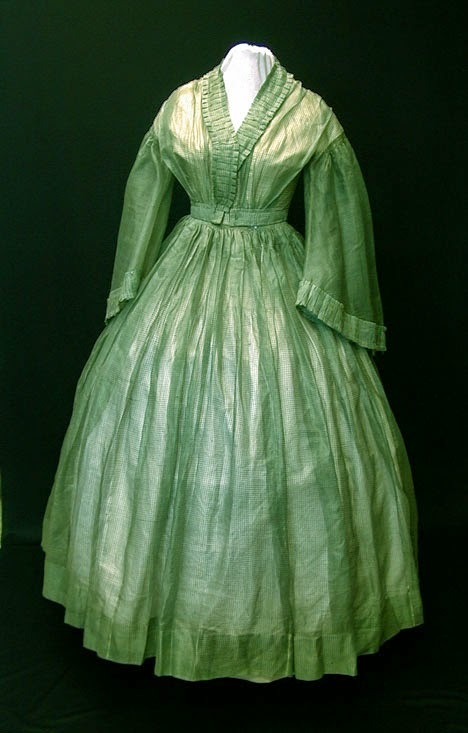 Sheer or semi-sheer fabrics of the 1860s came in cottons, silks and wools (linen wasn't typically used for dresses). In some cases, it is pretty tough to tell if an original garment is cotton or wool because the feel of both types of those sheers is almost the same. 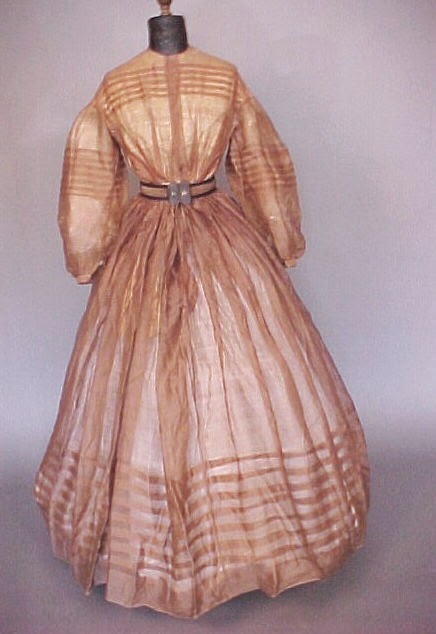 Sheer dresses could be made from either solid-colored or patterned fabric, just as regular dresses were. Solids were fairly rare and almost always silk since dyes weren't dependably colorfast in cottons and wools. Solid white sheers could be worn in any of the three fibers. But even solid colors usually had some sort of design in the fabric weave itself. While many sheer dresses are designed much like regular dresses - round collar, bishop sleeves, and so on - sheer dresses could also be designed for maximum coolness. It's quite common to see sheer dresses with v-necklines and open sleeve designs. On a sheer, undersleeves are not generally required (though some ladies still wore them). And it's also "allowed" to have a v-neck or crossover bodice that has no closure, such as buttons or hooks. 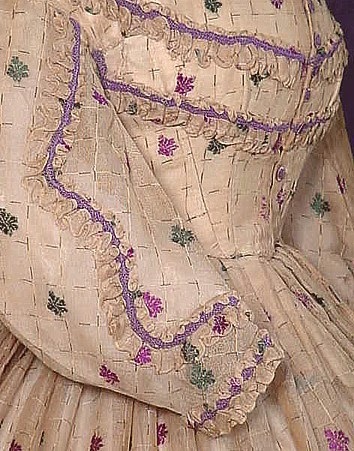 The bodice is simply held shut with a small pin. Trimming on a sheer dress was treated rather differently than trim on a regular dress. 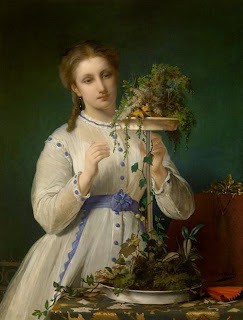 Because the fabric was so delicate, and because the point of a sheer was to have a light-weight, airy dress, sheer dresses did not have heavy trim. In fact, most sheers and semi-sheers were "self-trimmed" - that is, they were trimmed with pieces of their own fabric made into ruffles or ruching. At first, this might sound rather boring. I mean, a dress that is "trimmed" with just more of the same? 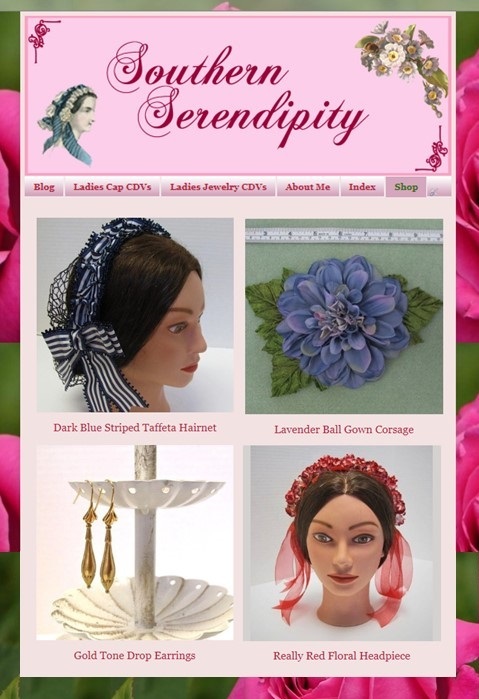 But when you start considering the possibilities of such adornment, there are really some fun options! Ruffles and Ruching - Large ruffles on the skirt create a "swishy" floating look that is so fun! Tiny ruffles on the bodice, sleeves or skirt could be gathered and sewn on in lovely designs. Small ruffles were often cut on the bias (diagonally on the grain of the fabric) so they didn't even need to be hemmed. In addition to a gathered ruffle, strips of fabric trim could be pleated or ruched into lovely designs. The green dress I show further up has box-pleated trim on the neckline and sleeves. Tucks - There's nothing more gorgeous than a full flowing skirt with zillions of little tucks in it! 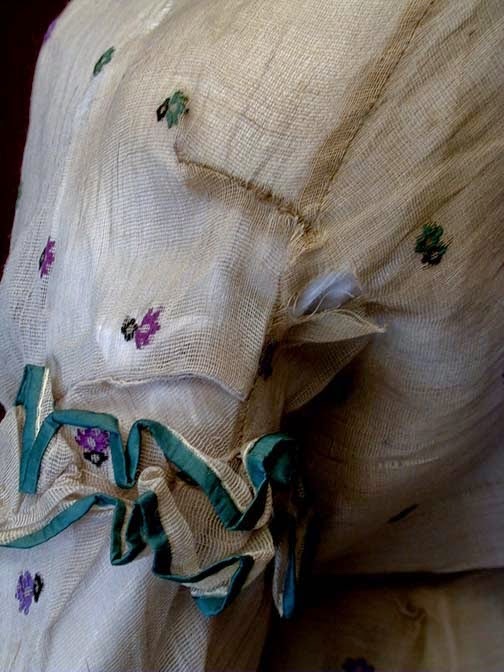 The tucks were not only ornamental, they also helped give body to the fabric. Tucks could be used not only on the skirt, but also on the bodice and sleeves. Since a tucks doubles the fabric on itself, it creates a dashing, darker stripe effect on the sheer fabric. Gathers - Gathers at the waist, gathers on the sleeves - even gathers on the bodice! One of my favorite effects on a bodice is when the fabric is gathered onto lengths of piping. This keeps the gathers even down the bodice and creates a wonderful geometric design. Ribbon - An exception to the "no non-fabric trim" guideline is light-weight ribbon or soutache, or a fine, bias-cut strip of fabric. This was occasionally used either to highlight the self-fabric trim or to bind the edges of ruffles and ruching. Sheer dresses are not only designed and trimmed differently from regular dresses, they are constructed differently. Obviously, the goal of a sheer was coolness and airiness. Thus, wherever possible, lining is dispensed with. Lining on any 1860s dress was partly for the purpose of protecting the fashion fabric from body oils. Thus, you will find lining on sheers was generally only where the danger from body oils was greatest - on the lower part of the bodice and under the arms. Sometimes there is no lining at all and the lady relied on her undergarments to protect the dress. If you think about it, lining fabric on a regular dress is attached to the fashion fabric at the armholes, shoulders, side-seams and waistband, and probably in some darts. 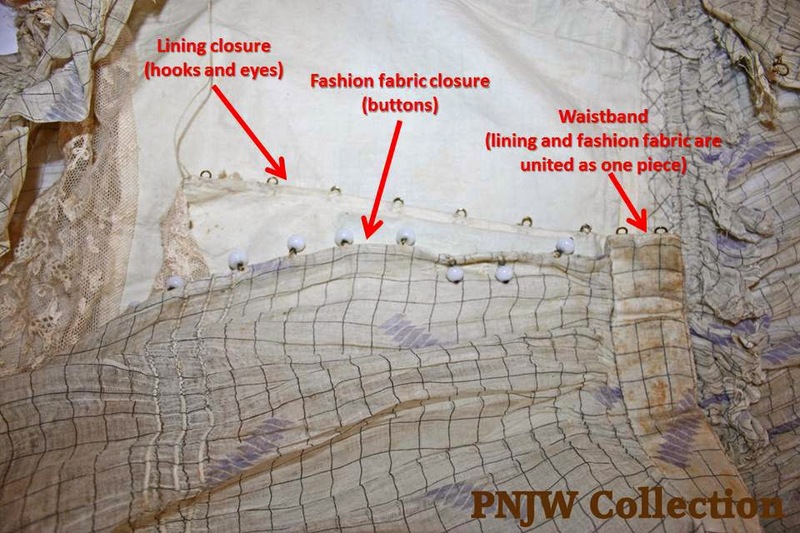 But in sheers, the "connections" are often only at the waistband and side-seams. The lining neckline could be dropped as low as the chemise neckline. In fact, bodice lining is often almost a stand-alone garment in sheers. In some cases, it even fastens separately from the fashion fabric. 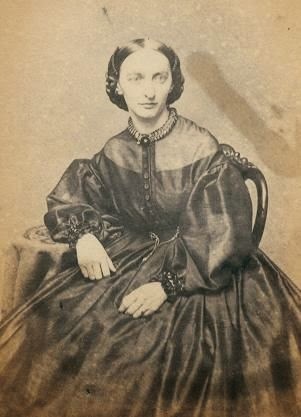 In many original photographs and paintings of ladies in sheer dresses, you can see the lining edge through the dress fabric. The lady's shoulders are often left bare except for the fashion fabric itself. Once again, the goal of a sheer was usually to have an airy, cool outfit. So you won't see tons of jewelry, watches, chatelaines, and such worn with sheer dresses. Heavy accessories could tear or snag the delicate fabric, not to mention look incongruous with the overall "floating" appearance. Earrings, a small brooch and possibly bracelets seem to be the extent of most ladies' jewelry with sheer ensembles. 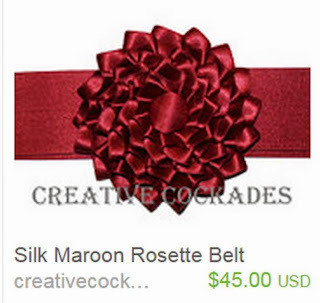 However, it is common to see a lovely belt and/or a floral corsage with a sheer dress. Belts could be self fabric (stiffened with some heavier fabric underneath), or they could be a contrast color. 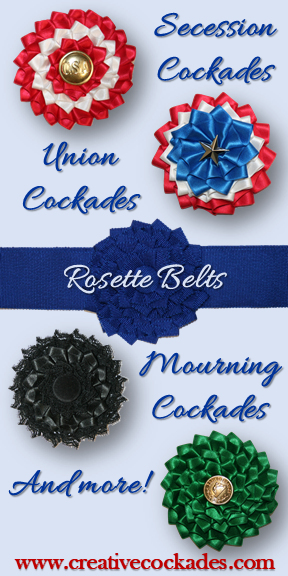 Belts ranged from a simple solid colored ribbon to elaborate bows or buckles and rosettes. The fun thing about a belt (as I know from experience) is that it is an easy way to change or update the look of the dress! Don't these two dresses just "pop" with their belts? If you want to see a lot more original sheer dresses from the 1860s, check out my Pinterest board here. And since I make rosette belts for my shop, I had a great time making us matching belts to go with our matching dresses! Ain't we cute? Some familiar stuff here -- the marquisette (ruffle with green satin binding) and the black-dot-on-white dresses are mine! Yes, Miss K, you have an awesome collection! And it's wonderful of you to share so many great pictures of your dresses so the rest of us can learn about them. Civil War Skirt and Blouse: Right or Wrong? 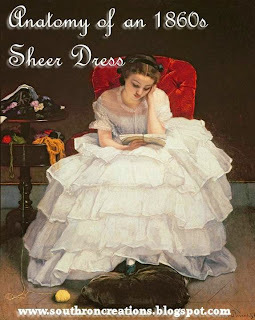 The Victorian Little Black Dress: Mourning or Not?